Last night’s Cape Winemakers Guild technical tasting explored the topic of Cabernet Sauvignon vs Cabernet Sauvignon blends. Presented by Louis Strydom of Ernie Els Wines, the intention was to remind everybody of the greatness of the variety, even though plantings locally are in decline. Some questions arising out of the tasting: Firstly, just how did Cabernet Sauvignon come to be the world’s most widely travelled dark-skin wine grape? It typically doesn’t give you that upfront burst of fruit of Merlot or Shiraz and is often overtly tannic. On the issue of blending, it seems curious that the South African wine industry is today so wedded to the Bordeaux model. Prior to 1979, when Welgemeend were the first to release a local Bordeaux-style red wine, just about anything went. Shouldn’t local producers be blending to do justice to their terroir rather than aping a region from abroad? The magnificently drinkable (if not super-complex) Chateau Libertas 1970 is a reference here. Lastly, there is no question that single-variety Cabernet Sauvignon is compelling but if greatness is to be achieved, then is some sort of blending a prerequisite? In conversation, Jan Boland Coetzee of Vriesenhof suggested to me that it depended how patient you were – straight Cab typically taking longer to come around than blends. 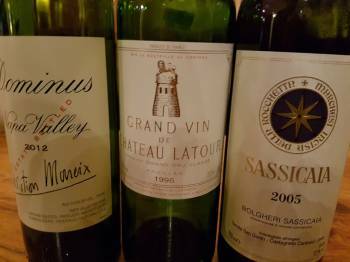 The Latour 1996, however, far outshone anything else on the night but doesn’t really settle the matter, being so Cab-dominated, specifically 78% Cab, 17% Merlot, 4% Cab Franc and 1% Petit Verdot. Christian: I assume the (?) for the Stag’s Leap Fay is because it was overly fruity for your taste, and just too stylistically different from what you’re looking for in a wine? Given your previous ratings of California reds, that you left the Stag’s Leap unrated isn’t surprising, but I was interested to see you enjoyed the Dominus. I haven’t had either (they’re both far out of my price range), but from what I’ve read, the Dominus is also very bold and fruit-driven. Can you give a little more detail on your thoughts about the Stag’s Leap and the Dominus? Did you manage to immediately pick the Dominus as Californian when you tried it blind, or is it more subtle? Hi Joe, The Stag’s Leap Fay 2012 is again one of those wines which is very highly regarded 96 points from Robert Parker, for instance) but I find excessive. My tasting note: “Heady floral perfume before black and blue fruit plus chocolate on the nose. Sweet on entry, thick in texture and hot on the finish.” I understand what Parker and others are rewarding – its an exceptional wine of its kind – but I simply couldn’t drink it and hence I’d prefer not to rate it. The Dominus, on the other hand, is pretty intense in its own right but I thought it retained some sort of balance. Hi Christian, another informative and thoughtful post, than you. My unfamiliarity with the foreign straight Cabernet shows hopefully an interesting future educational journey. In what is no doubt a request you’ve never heard before, I would like to get your thoughts about what this means for current incarnations of “straight” Cabernet. When you used to provide drinking windows in your Cabernet report, they tended to be conservative in being fairly early. What do you think the ageability and drinking windows could be for previous winners with a proven aging ability, such as Peter Barlow and Waterford? Hi Bobby, Apologies for the delay in replying. I’ve dispensed with advising on “drinking windows” as they involve so much conjecture. On the whole, I’ve tended to find modern-era SA reds are ready all too soon but there are of course always going to be exceptions – the Peter Barlow 2009 from Rustenberg definitely seems to be one for the long haul. Past a certain point, however, the amount of enjoyment you get out of an aged wine depends on your personal tolerance of developed/tertiary characteristics. The Woodlands gear is good stuff. Margaret River doing really well with Cabernet these days.